Worth a punt from Amazon! 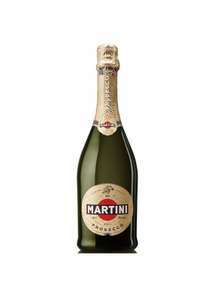 6 full bottles of Martini Prosecco (11% abv) delivered! There’s a few days delay on delivery however I’m prepared to wait ... for it to be cancelled maybe!! I’ve never yet had a wine miss price honoured by Amazon even less chance when it’s a 3rd party seller good find though op if it pays off! My orders gone through but payment hasn’t come off my card yet. Hope it turns up.My orders gone through but payment hasn’t come off my c …Hope it turns up.My orders gone through but payment hasn’t come off my card yet. Just expected it to show up as it usually does. Serves you right for being greedy and preventing other users from taking advantage of this ‘potentially’good deal. Maybe you could give something back to this site? !